In Temporum players will manipulate the course of history to their own benefit. Donald X. Vaccarino, creator of the millions-selling deck building game Dominion, has a new game on the way. 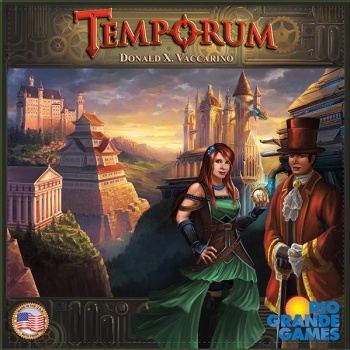 Rio Grande Games, publisher of Dominion, has announced that Temporum is on its way this August in time for Gen Con. In the game, players will manipulate the time stream by playing cards and spending money, trying to make it so history follows the course that makes them most powerful in their own time - right at the moment that time travel is invented. The game board apparently shows different paths that the time stream can take, with players shifting the true course of events back and forth. The game will be for 2-5 players and take between 30 and 60 minutes. In some of the best versions of reality, the Egyptians discover America, the industrial revolution happens early, and eventually robots take over. In others, the Renaissance produces a plutocracy, which leads to a utopia - or perhaps to anarchy; it's all in the subtle details. As a time-traveler, you've seen it all, and it all has its place. What's important is who's in control in the long run when time travel is invented. With other time-travelers mucking with things for their own reasons, your course is clear: You will tamper with history as much as is needed, stepping on however many butterflies it takes, to get a perfect world under your own benign rule. Sounds fun, but there's barely any details right now. Here's to seeing if Vaccarino can bottle lightning again!